Traditional wireframing is great for drafting ideas and getting them from your head onto paper quickly. You can always wireframe on computer paper but sometimes you’ll want a little more structure. That’s where Sneakpeekit can help. This free resource created by Pasquale Vitiello offers seven custom printable wireframe sheets from traditional dot grids to more specific layouts for desktops and mobile devices. You can print these as many times as you like and the grid remains the same throughout all sheets. Each file comes in a .zip pack with PDF documents for easy printing. Every template is designed for A4 printer paper, so you should have no trouble printing any of these templates. 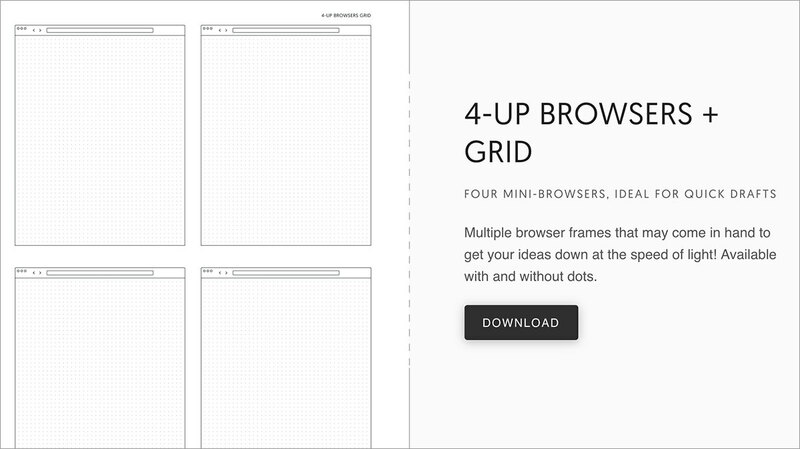 They certainly aren’t necessary but they can give you a big advantage wireframing on a grid. In the bottom corner of each sheet, you’ll find a space to write the title of the project. This way you can organize wireframes based on projects, drafts, revisions or anything else. Take a look at the site and see what you think. Not everyone will find a need for wireframe sheets but they can help organize your thoughts a little more. These sheets can also be used by icon designers, illustrators, brand artists, or anyone working with visuals. Plan on paper first to make the digital creation process that much easier!